LEVEL drive. The Wahoo uses warm-sounding analogue filters. As the signal feeding the filters is increased, the filter sound begins to distort and add pleasing harmonics to the signal. Turn the drive down for the cleanest sound, but if the drive is too low the signal will become noisy. Turn the drive up for lower noise, and warmer sounds: but if it is turned up too high the sound will become fuzzy, which can itself be a desirable effect. LEVEL filt mix 1/2. This controls the filter mixer: the proportion of filter 1 and filter 2 that form the output of the Wahoo. 0 gives 100% filter 1, 100 gives 100% filter 2. Note that, to make editing simpler, the active filter will automatically switch to 1 or 2 when 100% of that filter is selected. LEVEL dry/wet. This lets you mix the uneffected instrument’s signal into the effected output of the Wahoo. 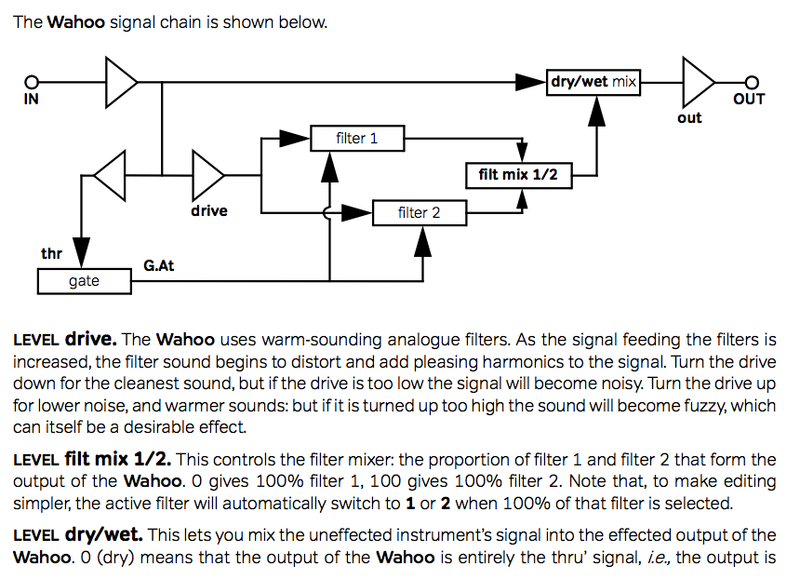 0 (dry) means that the output of the Wahoo is entirely the thru’ signal, i.e., the output is unaffected by the Wahoo filters. 100 (wet) means only the filtered sound is present in the output. This parameter be used to retain some of the sonic character of the original instrument sound. For example, for bass envelope filtering it is common to retain some dry signal to ensure the initial attack of notes is retained. LEVEL output (out). Typically you adjust the output level so there is a good balance between the original sound (when the effect is bypassed) and the effected sound. It is possible to increase the output level to boost the signal beyond the level of the original instrument level which can be useful, for example, to Overdrive the input stage of a valve amplifier. Note that at high output settings, the output stage will start to soft-saturate. This lets you achieve louder sounds without worrying about unpleasant clipping, regardless of how hard you play. LEVEL output (thr). Some presets, depending on the resonant filter setup (see the next section for a discussion on filters), have an audible output with no input signal. If you want to remove this, you can do so by adjusting the output threshold, thr, sub-parameter until the sound disappears. The threshold sub-parameter acts like a noise gate by moving the filter cutoff frequency to a lower-than- audible frequency when the input level is below the threshold you set. Because this is not a true noise gate, you may hear a frequency sweep as the frequency moves when the signal level falls to below the threshold you set.